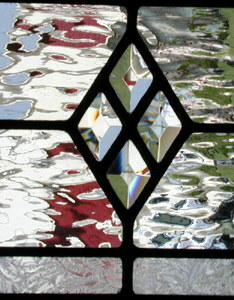 DIAMONDSD2 Small Beveled Diamonds Sidelight Window Custom Glass Design. "DIAMONDSD2" VERTICAL SIDELIGHT WINDOW WITH SMALL BEVELED DIAMONDS CUSTOM AT GLASS BY DESIGN. Leaded glass sidelight window was 12" x 30". The size of this design can be altered by adjusting the vertical spacing of the sections and/or adding more sections or removing one or more. The background was Waterglass and the border was gluechip glass.